At Absolute Digitizing, we impart matchless raster to vector art services to our clientele at the most reasonable terms. This is sometimes also referred as image tracing or vectorization. Our vector conversion services start from an unbelievably low price of $8. This includes any further edits to the first submission. All orders, once confirmed by the client, are prepared and emailed to them with in next 24 hrs. Working with us is inexpensive, fast and efficient. Our lower prices are intended at supplying vectors to businesses at the most affordable rates. These lower prices should not be implied for a lower and compromised quality. 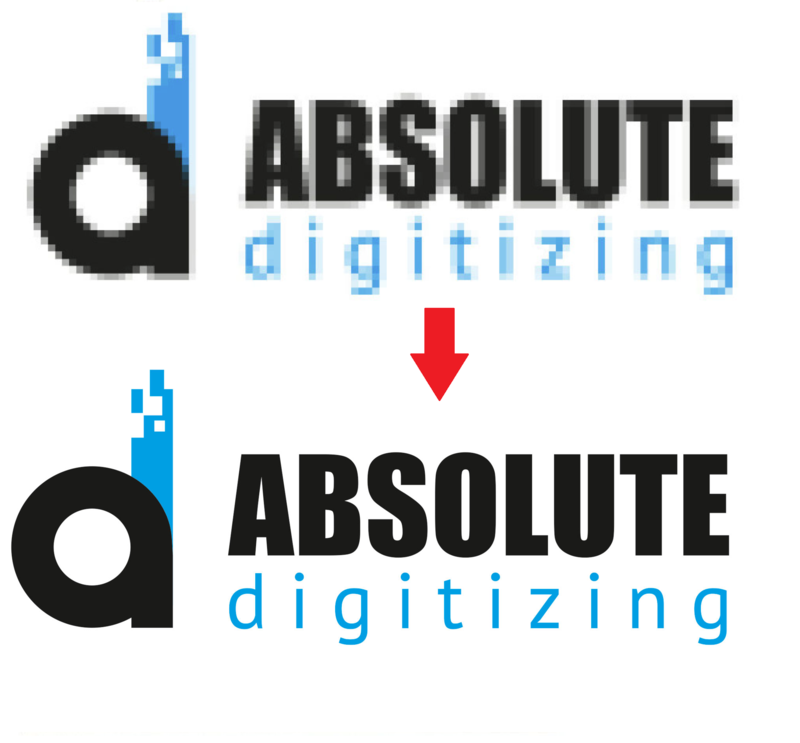 We, at Absolute Digitizing, have always kept quality at the forefront of all our priorities. We know that at the end of the day it is superior quality that lets us meet customer expectations. Get a free quote today as we not only understand your business concerns but are always striving to make the process simple, efficient and inexpensive for you. Order now or receive a quote for raster to vector conversion service here. Or download our free app for Android or iOS and get free quotes and estimates or place your orders conveniently than ever before. Vectors are fundamentally composed of points that are used to form lines and shapes, which when combined constitute a vector. Using this principle, an artwork created by using vectors to represent different design elements is known as vector artwork. Vector Art is a graphic image which does not lose its resolution and quality when resized. But we will not delve into how these mathematical models are created or work. Instead of trying to wrap our heads around the mathematical jargon, we will look into its application and what makes it a superior graphical representation. To be precise, vitality of vectors for custom printing industry and what triggers or encourages this rigorous adoption will be our primarily focus. But before we do that, let us quickly see how vectors have evolved over the years and what brought about its present day condition and demand. Vectors, as we know them today, have not always been design related. Digging into its origin, they were first used for military and civil air control purposes. However, vectors were first used for design purposes in the 1960s. Software, named Sketchpad, patented in the name of Ivan Sutherland, introduced the world to use of vectors in graphics and design. During this time, vectors required a lot of storage data. This was a major hindrance in wide-scale adoption. Moreover, it was also looked up as a costly method of producing artwork. Consequently, raster or bitmap images that were made of bits or pixels became a preferred format for storing image files. For the same reason, raster images are sometimes called bitmaps. Back in the day, they took much less space as compared to storing a vector graphic. For decades, raster graphics were, therefore, preferred and widely adopted. It was not until computer technologies made significant progress, and size of vector art files was no more a matter of concern. The price of producing this format was also pretty inexpensive. This saw an unprecedented and rigorous adoption of vectors by the design world because of its superior scalability and image quality. Scalability or Resizing of vectors is the most important, if not the only, factor for massive adoption of vectors by the graphic design world. Today, it is hard to imagine a graphic art without incorporating vector elements. The massive adoption is resultant of the characteristic enhanced scalability of vector art as compared to the raster images. Raster images are composed of small bits that contain the image details. If the image is expanded, the image becomes distorted. These pixels become evident when enlarging the image to a certain point and thus render a jagged outlook. This problem is commonly called pixelation of raster images. This essentially means that raster files cannot be easily scaled up without affecting the design elements of the artwork which primarily impedes its widespread adoption. Since storing a particular graphic of any size was no more a thing to worry about, vector artwork positioned itself as a superior alternative to raster formats. Instead of bits or pixels, the vector art is represented in shapes, lines, and curves. When resized, the overall integrity of the design features remains intact and unaffected. This goes on to imply that vectors are thus; highly suitable to be used where regular resizing of a particular graphic is required. After all, these graphics can be easily resized without dismantling the integrity of image quality and features. The use of vector artwork skyrocketed with quickly changing and ever growing advertising industry. From brochures, catalogues, pamphlets, huge billboards, to printing on apparel and garments, household items like mugs, towels and stationary, provides an increasing demand for graphics. The graphics, once created, have to be repeatedly resized without compromising the quality. This is where vectorization has paved a way for itself. Therefore, most of the graphic design that is being created today includes vectorizing. Every design that is created today comprises of vectorizing at one point or the other. Branding and promotions are no more limited to brochures and pamphlets. The world of custom printing is huge and it literally feeds on vectors. Before an artwork is imprinted on any product, it is first required in a vectorized format. The custom printing industry shows no signs of slowing down. In fact, it is expected to expand to more markets and products with more innovations to follow. Internet as we know it has played an instrumental role, for the growth and marketing of businesses all across the world. In today’s time, it is inevitable for businesses in most industries to have a vibrant online presence. Vectorization is considered to be most suitable option for online graphics. This is due to a range of reasons. To start with, just take an example of a business website. Having a great business website is an unavoidable part of having an online presence. Nowadays, it is expected from business websites to render a responsive experience to their visitors. Responsive websites adjust to provide an optimal user experience irrespective of the device (mobiles, laptops, tabs and TVs) that a visitor is using for browsing. Due to varying size of screens, SVG format vector graphics are being considered as an alternative to be used in websites in the near future. Unarguably, vectorizing is most profoundly consumed by the booming custom garment industry. Most of the designs that we see imprinted on T-shirts, jackets, trousers and other apparel mostly come from the vectorized format of the design. A vectorized format of the design is required before a printing technique is employed to actually imprint the design on a garment. The increasing use of vector art can be significantly attributed to the rise of customized apparel culture. Techniques such as screen printing, Direct to garment printing and heat transfer have prompted the trend, by making it convenient and inexpensive to customize garments. Screen printing is the most popular and oldest textile printing technique. The process is highly suitable for bulk production as the set up cost is significantly higher but production cost is lower. Once the set-up is ready for a particular design, it can be used to print the design on a large number of apparels. Though, the process is hundreds of years old, the basic principles are still relevant. The changes that are incorporated over the years have only made the process more efficient and speedy. Today, great vector artwork is a necessary component of professional screen printing. Image is mounted on fine mesh. A stoke of this mesh is used to squeeze and print desired elements of the design on the fabric. In each stoke, only one color is included in the design to be printed. Other areas of the meshed design are kept impermeable through the use of a stencil. A substrate for each ink is made, which only colors particular areas of the design using the stencil. Therefore, blank areas of the design are impervious throughout the process. Direct To Garment (DTG) printing is the most renowned digital printing technique. The technique is relatively new which uses electronic DTG printers for imprinting designs onto garments. The process is sophisticated but easier to operate as compared to screen printing. Commercial level screen printing requires heavy financial investment and huge set up costs. In comparison, DTG printers are relatively inexpensive and cost much less than huge screen printers. The only major downside of DTG printing as compared to screen printing is its slower speed. In orders, where there are hundreds of pieces involved, there is no counterpart to the speed of screen printing. But then again, this does not hold true for small orders. With small orders, DTG is a more time efficient process as set-up and dismantling takes only a portion of the total time required as compared to screen printing. Heat transfer presses are also pretty old, but the advancements in technology, have led to rendering the process a cutting edge control and operation. With features like touch screens and pressure indicators, today’s heat transfer process is quite refined. It is, thus, yet another type of digital printing. As a matter of fact, there is no single heat transfer process today. Different machines use different methods to imprint a design on to the garment. The governing mechanism of each type of machine is quite distinct to another. With that said, at a very basic level, the design is transferred on the garment by means of heat and that is what, despite being apparently quite different from each other, accumulates machines from different manufacturers under heat transfers. Raster to vector conversion also know as Vectorization is the process of converting any image that is composed of bits, into a file that represents same elements with curves, lines, and shapes. During this process, a two-dimensional raster image is converted into two-dimensional vector art representation. It is noteworthy that raster to vector conversion takes place only as a visual recognition. In the mean process, the visual attributes of the objects remain almost the same. A professional artist uses a graphics editing software like CorelDraw or Adobe Illustrator for this process. The design elements of a bitmap design can then be traced using the features of these programs. Consequently, a vectorized format of the image is produced. Vector art is produced in different formats. The most popular formats are EPS and SVG. For professional raster to vector conversion service, get in touch with us today. Our team of professional artists will ensure a delightful experience by meeting your expectations in the most efficient way you can imagine. After all, we are amazingly quick, extremely inexpensive and absolutely convenient to work with. Get a quote today and get things going! Are you looking to design a business card? A badge? Or going for something huge truly gigantic, such as a billboard? If you are looking to print something, a design or your business logo in unusual sizes, you need vector images. If you are not a graphic designer, probably you have not heard about a vector image for printing. Any normal image that is taken by a phone camera, even a DSLR or a scanned image is a raster image by default. It has limited scalability and does not do well with unusual sizes. If you try to stretch it either way, the image will burst into a cluster of boxes, known as pixelation. A pixelated image cannot be printed because you cannot see anything besides a clutter of boxes in various colors. Thus, it becomes necessary to convert an image to vector and be able to use it as per desire. If you are not an expert in graphics, you probably don’t realize image file types can be distinguished by their extensions. For example, a raster image will have the JPG, PNG, TIFF or BMP extension usually. A vector image has EPS, AI, SVG or CDR file extension. It is because they can be accessed, opened and edited by a specific software. Usually the software is either Adobe Photoshop or Corel Draw. Businesses are usually concerned about their logo. Obviously it is their key image to branding and every business wants its logo to be famous. If a logo becomes well recognized, it means the brand is getting a huge boom in their sales. It is a common consumer psyche, the more famous a brand is, the better it is. But hey, who can challenge the buyer, the customer is always right and this fact cant be argued if you want to run your business successfully. Probably when you’ve got your logo made and asked your graphic designer to send over an image file, he has sent you a raster file. While it may have not hindered your work when printing on letterheads and A4 sized papers, but for advertising you will need vector made of it. Surely if you have not heard about a vector before, your printer has told you about it and now you are looking for solutions. You can even ask us to convert your logo to vector because our excellent services include the vector art conversion. We are a team of experts in the graphics industry and have an impressive history of having worked successfully on over thousands of designs. We give our customers great memories when working with us because we deliver the best results. So, if you have a raster image and want it to go for printing, you have reached the right company to do the job for you. We can convert any raster image to vector without excuses. If you have any low resolution images that are in need of an upgrade, we are up for the challenge. If you really are considering the service for your business logo, then we suggest you never settle for less. As we all know advertising is the key to business growth today, it is extremely important to have your logo worked on by an expert. Having your business advertised on billboards around the city will certainly earn you a boost in clientele. But if the logo is not visible clearly, that can be a great setback to the entire campaign. We work using the latest hardware and up to date software. Using the latest technology is extremely important to deliver great results. We really do understand it and keep ourselves one step ahead of competition. But that simply does not mean we are unaffordable. Yes, our charges are so down to earth you can hire our services even on a really tight budget. Businesses and individuals require vector images to use for unusual sizing. Standard raster images come with very limited scalability options. It limits the use to normal prints but when you need to think outside the box, you need more. Thus, it becomes essential to convert the raster also known as bitmap image into a vector. Bitmaps are made up of pixels that are similar to minute boxes. When arranged systematically, these boxes do not reveal their edges. The image is presentable but it cannot be rescaled too much. Upon messing with the originality, the pixels burst out revealing their jagged edges. It looks very messy to see uneven edges giving it a blurred look. Surely you don’t want to look unpresentable in front of your customers. Advertising is the key to business growth and your campaign needs to be flawless. The images on billboards or any other medium where you plan to promote should have clarity. Blurred or pixelated images and text will fail to deliver the correct message. Make sure you connect with an expert graphic designer before going for printing. The designer can convert bitmap images to vector art that serves the purpose perfectly. Another benefit of vectors is, the colors become sharper and edges are smooth. It means your images and text will be visible clearly even from a distance. How to Convert JPG to Vector? This is a tricky question. When starting an advertising campaign, the biggest challenge is to manage the costs. The search to convert JPG to vector begins immediately. Most people assume it an easy task or they can find a free solution on the internet. Unfortunately this is not the case. The process is a manual task and requires special software and skills. Unless you know how to use the software like a pro, getting desired results can be an uphill task. It requires a lot of dedication and many years of practice to learn a software such as Corel Draw. Surely no one can spend that much time to learn unless they want to build a career about it. Unless you want to be a professional graphic designer, you will soon lose interest in the software. It is not only about using a set of tools, designers are naturally creative. An image may look harmless but when you try to convert it into a vector, the task can be difficult. This is one reason there are no free converters that can be trusted for the best outcome. When you want to achieve great results, the best option is to contact a professional graphic designer. Most people think it will cost a fortune to hire a professional for their simple conversion. Truth be told, hiring an expert graphic designer is not like hiring a consultant. Designers are affordable and they do not charge per hour, rather they charge per task. It does not matter if they need to spend an entire day on one image. The charges are nominal and easily affordable. Do you know working with a graphics agency is more convenient than working with a freelancer? With a company, you get to receive work within the deadline. Prices are fixed and you won’t be getting messages to please raise the invoice. The work delivered is professional and up to the mark because it is handled by an experienced person. After getting clearance from the QA department it is sent to the customer. Some people think that opening a bitmap image in Photoshop, and saving it as SVG solves the problem. In reality it does not solve the problem one bit because that is not how it works. The phrase convert JPG to SVG actually means to reproduce the JPG image as an SVG image. It needs to be redrawn from start till end which is a manual task. The JPG might be a picture taken from a camera. No one had to draw it to become a bitmap. For vectors that is not the case and every inch of the image is drawn as if you would on a piece of paper.